Made in the UK to the very highest standards, our range of artists oil colour offers unbeatable value for money without compromising quality. I have only just begun to use Jacksons own oil paints and have found them quite acceptable. Used these paints since 2004 and I think that grading them as "student grade" is both misleading and as it happens, untrue. Cheaper grade paints usually have about 25% pigment, and the rest is oil and inert filler. Thus the price is a lot cheaper. However, this has never been the strategy at Winsor & Newton. Ever since its inception, WINTON has always been noticeably a far better paint, because the often very expensive pigments were replaced by modern synthetic organic pigments. Thus instead of using 25% pigment, Winsor & Newton makes WINTON with a full pigment load ground in exceptionally good Linseed Oil, and a small addition of components required to optimise the handling of each colour. 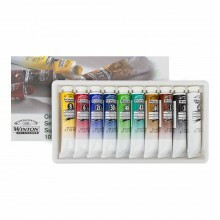 As a result, WINTON is actually better than some so-called "artist grade" paints and largely explains why professional artists also stock it in their studios. Colours are very clean, smell beautifully of pure and honest Linseed Oil, and handle great, with a nice, fairly firm buttery feel. WINTON is a product of excellence, it is Studio Quality, rather than "student grade", it is a paint that stands shoulder to shoulder with brands like Lukas Studio, Lefranc & Burgeois Fine, Sennelier Rive Gauche and Maimeri Classico.